Hello! My name is Suzanne Novak. As a busy Realtor with a hectic schedule, and a husband who coached in the NFL, we needed a place to escape the stresses of our jobs. One trip to Destin and we were hooked! The moment we set eyes on the Powdery White Sand Beaches, and the Crystal Clear waters of the Emerald Coast, we knew we would never need to go to Mexico again! We found our Caribbean at Crystal Beach and Grand Caribbean East. Our stresses melt away when we are at this condo. Get up in the morning, enjoy your coffee on the balcony, check email with Free WiFi and then walk across the street to the beach! We come back to our condo for a snack and then head back to the beach. Sometimes we shop and sight-see but we love to be perched on our chair enjoying the spectacular wild life show at hand. Dolphin, pelicans, and many different species of fish. This View Is Spectacular! 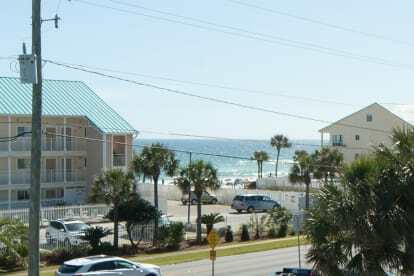 An end unit, on the corner, GCE #301 has an unobstructed view of the Emerald Waters of the Gulf of Mexico. Grand Caribbean East is a perfect location just steps to the beach. It is an extremely well maintained building. With a hardworking property manager on sight, the pool and hot tub are clean, the grounds are impeccable and the landscape lush. The View, The View, The View! Grand Caribbean East 301 is an End unit. This means when you are on your balcony, you have total privacy and a great view of the Gulf and the strip. You can see the Gulf from the Kitchen, Sofa, and Bedrooms! Enjoy watching the dolphin swim by or the great fishing boats! There is always a beautiful show to be seen! 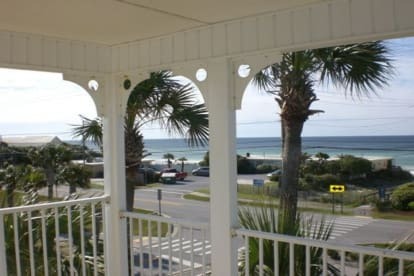 Panoramic View - Steps to Beach!! !